Dominic Lipinski – WPA Pool/GettyQueen Elizabeth II greets Saudi Crown Prince Mohammed bin Salman at Buckingham Palace on Wednesday. Saudi Crown Prince Mohammed bin Salman arrived in the UK on Wednesday. He was greeted by Boris Johnson upon his arrival, and has met the Queen for lunch. Many people are protesting his visit, however. 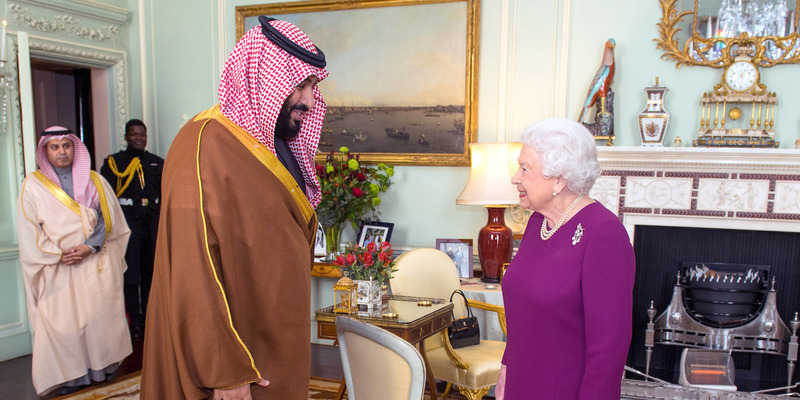 The Crown Prince of Saudi Arabia has met the Queen Elizabeth II for lunch on the first day of his extravagant state visit to the United Kingdom. Mohammed bin Salman arrived in the UK on Tuesday night, and is expected to spend three days in the country. This is his first visit to Britain since becoming Crown Prince last June. 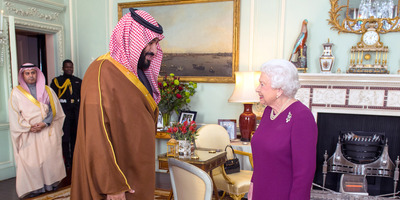 The Queen hosted the Crown Prince for a lunch and private audience at Buckingham Palace on Wednesday. All foreign dignitaries are invited to meet the Queen and other members of the Royal Family during state visits. Footage below shows Crown Prince Mohammed’s arrival, and the two royals meeting. Saudi news channel Al Riyadh tweeted a video of Crown Prince’s arrival around 1 p.m. local time (GMT) on Wednesday. Photos of the Queen and Crown Prince’s private audience were also posted online. 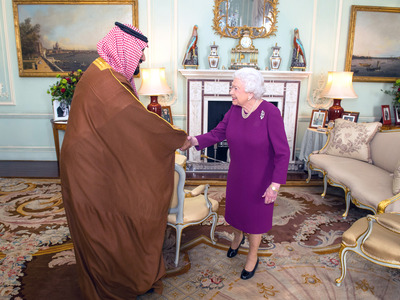 The two royals shake hands, which is the standard Saudi greeting for people meeting for the first time. The Crown Prince left the Palace before 3 p.m., after a roughly 90 minute visit. Britain is rolling out the red carpet for the Crown Prince Mohammed, also known as MBS. Over the course of his three-day visit, he is also expected to dine with Prince Charles and Prince William, and visit the UK Prime Minister Theresa May’s countryside residence, Chequers,Al Jazeera reported. UK Foreign Secretary Boris Johnson also greeted the Crown Prince at the bottom of his plane when he landed on Tuesday night. Not everyone is happy that Crown Prince Mohammed is in town, though. People protesting against Saudi Arabia’s involvement in the deadly Yemen War lined the streets of Whitehall earlier on Wednesday, with pro- and anti-Saudi posters and ad campaigns being displayed all over the capital.